I don't know about you, but I've always found shopping for my parents to be the toughest assignment. For years growing up, it doesn't even occur to you to buy them presents, and when you finally decide to start, it's impossible to catch up with their level of generosity, or so it seems. These gift ideas are perfect for Mom and Dad, but also grandparents, newlyweds, aunts and uncles. My mother is an amazing cook, but most of her kitchen gadgets are circa their 1978 wedding. Why not replace that beat up toaster or ancient coffee grinder, and throw in a few fresh dish towels to match? I love this remote meat thermometer–no one will burn their thumb trying to pry our Soviet Era gauge out of the roast this year! My parents are wine aficionados, so the liquor cabinet they've built is rarely put to use. That's not to say they don't go mad for the cocktails John whips up whenever he comes to visit, so a book of classic cocktail recipes is a gift that will put their booze to good use. In general, I love books as gifts–and even better if it's a book you've read and loved. My dad's been reading through my high school assignments (I always bought my own copies so I could make notes in the margins) and I think reading what I had to say is half the fun! A new throw (or decorative pillows) spruce up that couch they've had for as long as you can remember, but makes a great gift for grandparents or couple friends, too. My favorite gift tip for newlyweds? Buy a few extra things off their registry (towels are my favorite, but a few extra place settings are always a good idea, too! )–and give them to them after the wedding, once all those fresh white towels have dulled. Apple products always make great gifts, but what makes this idea special is personalization. When I bought a new Macbook, I gave the iPod Touch it came with to my mom, filled to the brim with my favorite operas. It would have taken her ages to figure out how to add songs (am I the only one with technologically hesitant parents? ), and their musical library is on CD, cassette tapes and vinyl, not digital. Once she figured out how to push play, she had a college level Opera Education course waiting for her! Of course, it doesn't have to be opera; fill your parents' with your favorite tunes, and include some of their favorites, too! A framed photo is a traditional gift, but that doesn't mean they won't love it. Sure, they can check out your Facebook account for recent photos, but frame those engagement shots or wedding portraits (or even a great candid), and send Mom and Dad a copy in a lovely frame. A copy of my current headshot sits on our kitchen counter; even when I'm far away, I can still join them for dinner! Tell me, who do you find hardest to shop for? my mom... she's so hard because she is such a simple person that she makes it so hard!!! love your lists of the past few days!! Love these guides and I agree...framed photos are always a hit! My Mom is the hardest & easiest. Buy her a Starbucks card for her latte addiction & she is the happiest woman alive. But my sister & I always feel like we should be more thoughtful & creative which is mission impossible. My father is! He doesn't like any of the traditional "dad" gifts. my mom's got to be the easiest person to shop for. She loves cookbooks so thats what she gets...every year. What great ideas!! My mom and dad are definitely the hardest to shop for... if they want something they usually buy it themselves, so I have to be extra creative. Pre-loading music/videos on tech gadgets is such a great idea :-) I'm sure any mom would love that beautiful chevron throw! 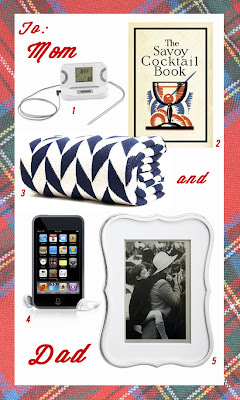 I absolutely love this--the first 3 items may be going to my parents this year! I'm willing to be your mother or your best friend, if gifts like these are the norm. Kyle's brother got me a Boys to Men CD one year (one year that wasn't 1997) and I've never gotten over the shock of such a strange gift. 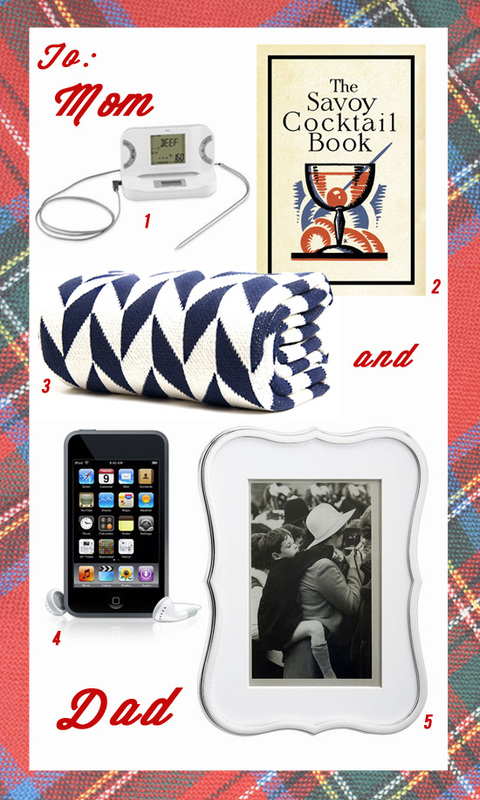 Great gift guides. I'm in love with the blanket! I got my mom a nano two years ago, knowing she'd be over the moon, but also because I knew my dad had bought her her first laptop. We made sure she opened mine first and she was SO excited and immediately started making plans with us to teach her how to use it on our own computers. Then when she got her own laptop she was speechless! It was super cute. Unfortunately, I feel like that was my last good gift idea for her, so I'm glad to have your lists to go from! Parents are so hard to shop for! This post is perfect. Thanks for the awesome tips!